Mr Lowel Wesley, Chief Trade Negotiator of Liberia has said the African Continental Free Trade Area (AfCFTA) framework agreement could suffer great jeopardy if Nigeria fails to sign the accord for the formation and implementation of the trade policy. He said in an unlikely event that the most populous country in Africa withdraws from the deal, though the rest of the continent would proceed, this could disrupt the continental intention of a single market reality and therefore hamper the principle on, which the trade framework agreement is being knotted. Mr Wesley was playing the ‘devil’s advocate’ during an interaction with 34 members of the Network of Economic Journos from ECOWAS member countries, an initiative of the Economic Commission for Africa Sub-Regional Office for West Africa (ECA/SRO-WA) to hone their understanding on the AfCFTA, underway in Monrovia, Liberia. The workshop aims to deepen skills of the Journos on the processes, negotiation parameters as well as advocate actions for the AfCFTA, its ratification and implementation. It was organized by ECA/SRO-WA, ECOWAS Commission under the auspices of the Liberian Ministry of Commerce and Industry. He said Liberia was working assiduously to have the framework agreement signed, sequel to developing a trade policy and build capacity at all levels, improve value addition to participate in the continental trade market, stepping up support for micro, small and medium scale enterprises, with focus on the private sector and women. He said a taskforce was established by the government to facilitate all these. Mr Dosso Bakary, Acting Director of Economic Commission for Africa, Sub-Regional for West Africa (ECA/SRO-WA), however was optimistic that, all things being equal, Nigeria, as Africa’s largest economy of US$ 594 as of 2017, would append its signature to the agreement to complete the league. He noted that Nigeria’s small-scale and medium enterprises and captains of industry and trade had expressed misgivings about joining the agreement fearing for disadvantage. He said intentions from high places indicate that the most populous country on the continent would do the honourable thing, when issues of benefits of a single currency regime and the impending elections were cleared. Mr Bakery said the creation of a single continental market for goods and services with free movement of business, people and investment will facilitate deeper integration and turn the 55 single African economy into a more coherent, largest single market, functioning better, to promote competition as well as boost intra-African trade. Meanwhile, 49 countries out of 55 have signed the agreement as at February, 2018, with 18 countries having ratified the AfCFTA agreement, four more shy of the required figure of 22 to make the framework operational. 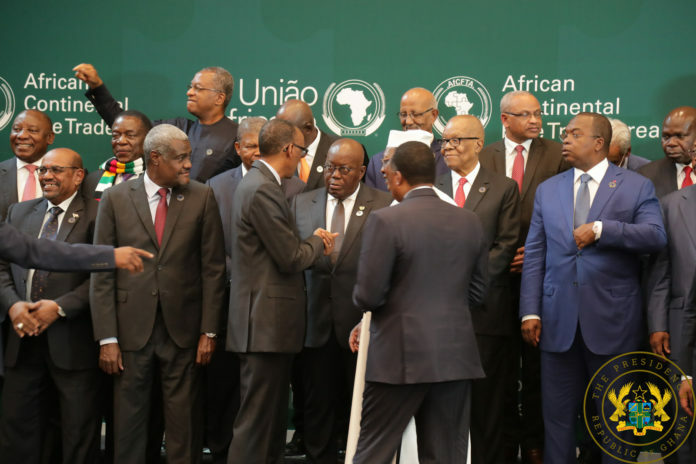 Thirty countries have so far also signed a separate Africa Union protocol on Free Movement of People (PFMP), which complements the AfCFTA, which provides visa-free travels, rights of residence, business or professional establishment for citizens between signatory countries.